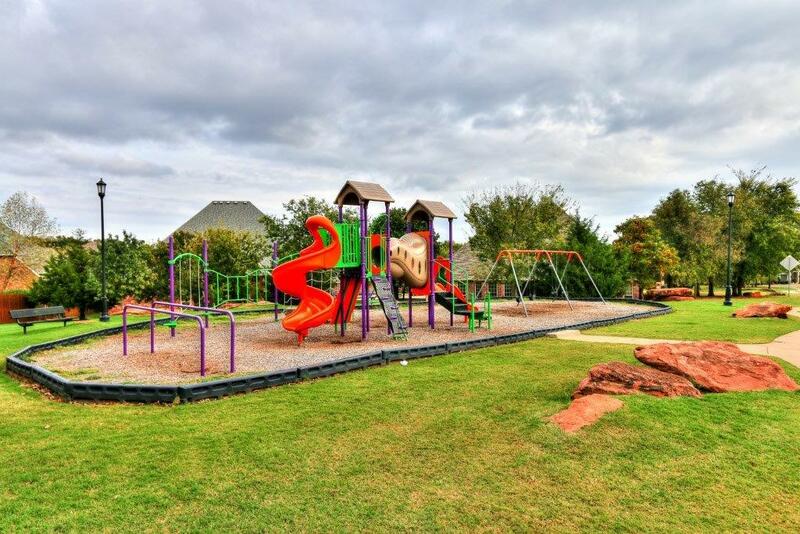 Belmont Farms is an elite residential neighborhood in the north of Edmond between Kelly Ave and Coffee Creek Rd. One of the many pre-planned communities to develop in the burgeoning north, Belmont Farms offers several amenities as well as close proximity to schools and shopping areas. Click here to see all homes for sale in the Belmont area. As Edmond continues to grow, the outskirts of the city becomes a more desirable place to live. Within the past decade there has been a boom in development in these areas, but with one important distinction. These entire communities have been meticulously planned from the bottom up to prevent any development within the neighborhood that doesn’t fit the atmosphere. Belmont Farms was created from the ground up to provide a safe and secure lifestyle for people who want a nice residential neighborhood to come home to. Belmont Farms only used prestige construction companies with solid reputations to complete its vision of a community where quality estates match the style of life they are representing. The development of Belmont Farms happened in stages, leading to a community that is divided into separate regions based on lot sizes and price points. As you drive in from the south entrance, Belmont Estates will be to your right. These are the largest and most expensive properties in the region and there is only one entrance and exit to the Estates. The average size of a home in the Estates is 3,700 square feet. On the left are the first two development sites: Belmont Landing and Belmont Village. The Village has medium sized properties that average 3,000 square feet and Landing has the smaller homes at an average of 2,600 square feet. Belmont Farms continued to expand with Belmont Park I, Belmont Park II and Belmont Park III. These areas surround the second pond and all offer similar homes that average 3,200 square feet. There are plenty of benefits in and immediately surrounding Belmont Farms. The community itself has two large ponds, one on the west side of town and another on the east, which are used by families for swimming and tubing. If the natural waterways are not your style, there is also a community pool right in the center of the residences that provides a place to lounge as well as facilities so people don’t need to keep running to their homes to clean up or use the washroom. There is a long trail that spirals through the trees in Belmont Farms that is used by residents as a way to get some fresh air and enjoy their neighborhood while jogging, biking or just going for a stroll. 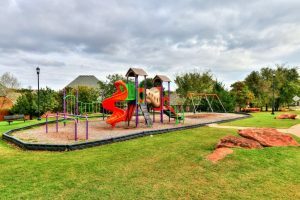 Outside the community is the local elementary school, invaluable to have within walking distance, as well as two golf courses and a country club. This gives some variety to avid golfers who are always looking for a new course to master. A quick drive south along N Kelly Ave will bring residents into the North Oaks Shopping Center, where they can enjoy some great shops, jump in for a quick bite at one of the fast food joints, sit down for a full meal at Johnnie’s Charcoal Broiler or grab a drink at Bricktown Brewery. One block to the west is a second shopping center, this one with major retailers like Wal-Mart and Kohl’s surrounded by smaller shops. There is nothing like feeling safe in your own home. Pre-planned communities like Belmont Park take this into consideration and make it a point to provide a level of security to all residents. 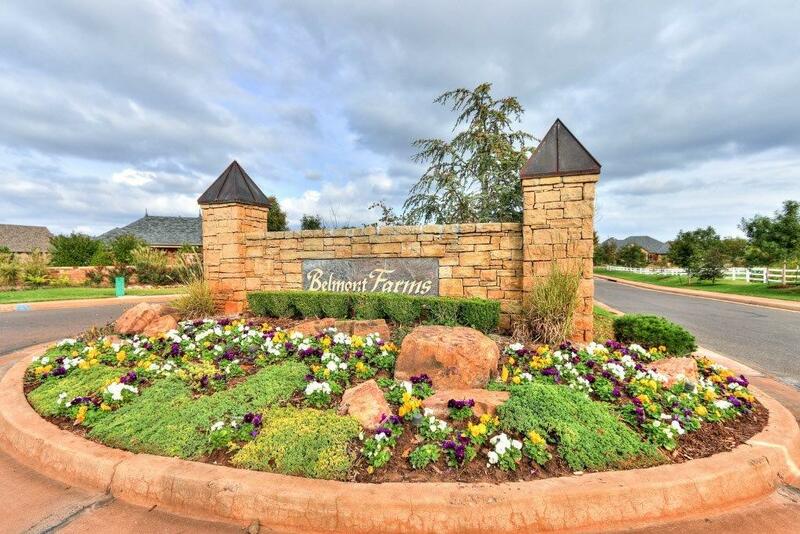 Belmont Farms only has three entrances into the community, cutting out almost all unnecessary traffic as the only people who will be driving through are owners or visitors. The playground, ponds and pool are all in plain sight of many homes, so children who are playing do not have to run off somewhere out of view where they can’t be monitored easily. The homeowners’ association makes it simple for residents to get to know each other so this feels like a community of neighbors and not a neighborhood of strangers. These carefully planned communities are extremely popular for their many benefits and finding a home in the neighborhood of your choice can be difficult without the right help. At The Sikes Team we can show you the differences between the many communities around Edmond and help you decide which one is right for you. From there we will work tirelessly to find a home that fits all your criteria in your chosen neighborhood.